Mr. Belyea is currently the newest Artistic Director of Balagan Theatre, and directed True West for that company this past season. Shawn is Executive Producer of 14/48, the world's quickest theater festival which won the 2008 Seattle Mayor's Arts Award. Mr. Belyea is company manager for One World Theatre, a member of the board at Live Girls!, and treasurer of Greenwood Lodge #253, Free and Accepted Mason's of Washington. As an actor Shawn appeared last season at The Seattle Rep in Opus, Glengarry Glen Ross and Welcome Home Dean Charbonneau. Last season he was seen in Henry IV and Servant of Two Masters at Seattle Shakespeare Company. 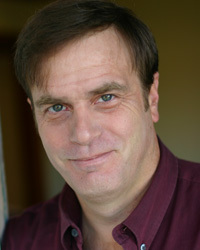 As a proud local artist, Mr. Belyea has acted and directed with many companies in Seattle including; ACT, On The Boards, Seattle Children's Theatre, Freehold, Live Girls!, Triad Ensemble, The Seattle Public Theater, The Village Theatre, Consolidated Works, CHAC, and Theater Schmeater just to name a few. As a teaching artist Shawn has worked with many organizations in Seattle and is currently directing Love Labour's Lost for The Seattle Public Theatre Youth Ensemble summer program. Shawn lives happily in Magnolia with Sandbox member Megan Ahiers, and is the proud Poppa of Zoey Belyea, founder of Young Americans Theatre Company. Shawn is glad of all the contacts he has made through the Sandbox. Dare to play.